"Enemy Fleet at Sea!" - oil on canvas. 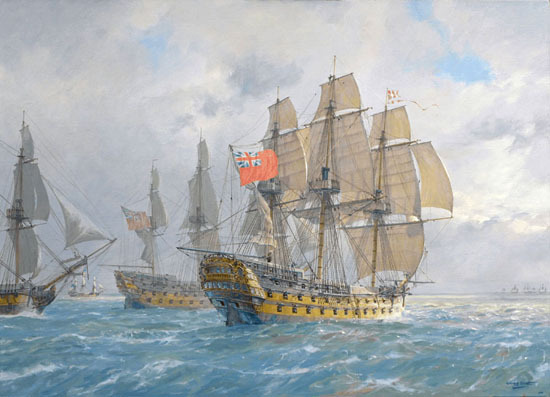 Art Marine is pleased to be able to offer original paintings by Geoff Hunt. Original works directly for sale are very rare as so much of the painter's output has been painted to commission for private patrons. You can commission a painting by Geoff Hunt through Art Marine - if this is of interest, please contact jt@artmarine.co.uk for details. Buy rare original paintings by Geoff Hunt directly from this gallery. Art Marine is always interested in purchasing original paintings by Geoff Hunt. Please email or telephone Julian Thomas. Shipping costs are quoted extra. 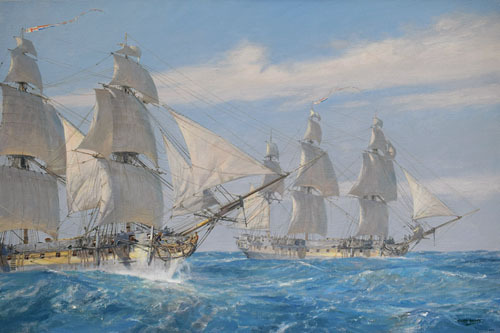 "Captain Bligh goes to War" - original oil painting, sold by Art Marine to an British collector, 2017.